The purging of UKIP and holding back the hard-exit Brexit Conservatives from majority power in the UK can be compared to the electoral defeat of those far-right politicians in Austria that wanted to leave to the EU, or those in France who had the same intention and who lost so decisively so recently, or to the failure of the right to rise in the Netherlands in the most recent general election held there. Across Europe the far-right is on the back foot and greater solidarity is gaining in popularity over division. In the three maps above, the seat by seat results of the June 2017 election are shown with the purple coloured seats being those Labour won from the Conservatives. So how did they do it? Labour were hugely helped by the almost complete collapse of the EU-hating UKIP party. Most UKIP voters had previous been Conservative supporters, but a disproportionate number switched, via UKIP, from Conservative to Labour in June 2017. Labour were helped greatly by tactical voting from anti- Brexit party loyalists. Large numbers of Green and Liberal voters lent the Labour party strength in the seats where that was most needed. Significantly, had Labour voters reciprocated a little bit more, then the Conservatives would not have been able to try to form an alliance with the most extreme right-wing party of Northern Ireland. The maps and cartograms above show which party is now second placed in each seat. This is where the battle will next be fought most closely, in many of the red (Labour second placed) and orange (Liberal second placed) seats in the South of England, and where the SNP are now second in Scotland (coloured yellow below). And many of the seats below where all these three non-Tory parties are now second are also now marginals. A few weeks ago that would have been seen as impossible. The election result has slammed the door on talk of a ‘hard Brexit’. The swings in votes and changes of seats were enough to bring about an end to talk of “no deal is better than a bad deal”. Young adults, who swung most to Labour, are most against Brexit. Of course, the Labour party is still committed to a soft Brexit. It is not committed to a ‘red white and blue’ Brexit… perhaps it could consider one in a different form? The flag of Norway is red, white and blue; and Norway is not a member of the EU; but it is a member of the European Economic Area (EEA) and the European Free Trade Association (EFTA). Brexit may still go ahead, but rather than the Turkey-style Brexit that the Conservatives were planning, where UK citizens would have less rights than Turkish citizens in Europe (and vice versa), something very different now becomes possible. In the months to come, what is possible may well change again and again. The near impossible has already happened once in 2017. In just the weeks to come, you will hear about the views of people from dozens of different countries on the European mainland. You will hear about a concerted and agreed ‘European view’. You will hear a great deal about what is means to be European, what the benefits are, and about how great diversity is accommodated both across the European Union and with almost all other countries in Europe that are not members of that Union but are closely and cooperatively associated with the Union. And you will hear more and more about what the next, younger UK generation wants and why it rose up in June 2017 and voted so decisively and in such huge numbers; in many cases for the first time ever. If you want to know a little more about the continent we live in; about the people and places, regions, cities and countries that make it up; about the tolerance for difference across it; about how migration is so much higher in some many other parts of the continent; and about where the young go to work and study and settle in Europe – we have drawn an atlas for you. 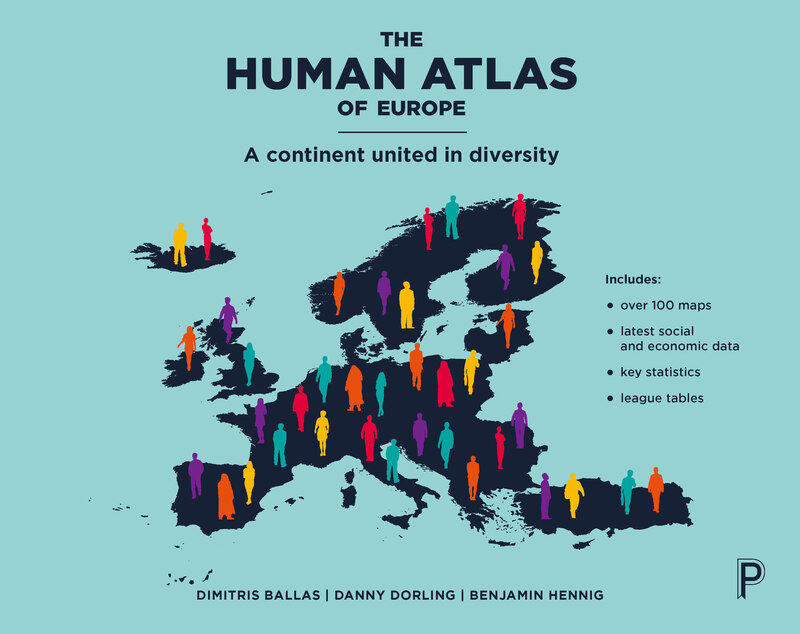 It contains maps and cartograms like those above, not for just one country, but for a continent of countries and regions, united in diversity, born out of the hope of a previous young generation. The undergraduate population of England, where the biggest swing to Labour occurred, need to own up. Yes Corbyn came up with some classic left-wing populist ideas, just as Brexit came about due to populist right wing ideas, but the truth of the matter is that you were bought by an irresponsible manifesto commitment to abolish tuition fees. I speak as one who voted Labour during its most left-wing period. My son is an undergraduate and he told me exactly how brain washed you lot were. If you had all grouped together on Facebook last year, in the same way, you might have stopped Brexit. How do you think (Oxford undergraduates excepted) the nation’s student fees can be paid by the taxpayer. It was Brown, not a Conservative government who increased them to up to £9K a year. How can you be sure that young people voted Labour because of its stance on Brexit, rather than because of tuition fees promises, housing policy, the NHS etc ? Given the recent confirmation that Labour intends to leave the Single Market, it’s fairly difficult to see much practical ( rather than rhetorical ) difference between the two main parties on Brexit. Even as an avid ‘remoaner’, I found myself rather surprised by the overtly partisan tone of this ‘academic’ analysis. Frankly I was disappointed that the evident political persuasions and aspirations of the authors seemed to outweigh the powerful messages that could have been more cogently delivered through a dispassionate presentation of the analysis.